An open fracture is an injury that occurs when a broken bone is exposed through the skin. 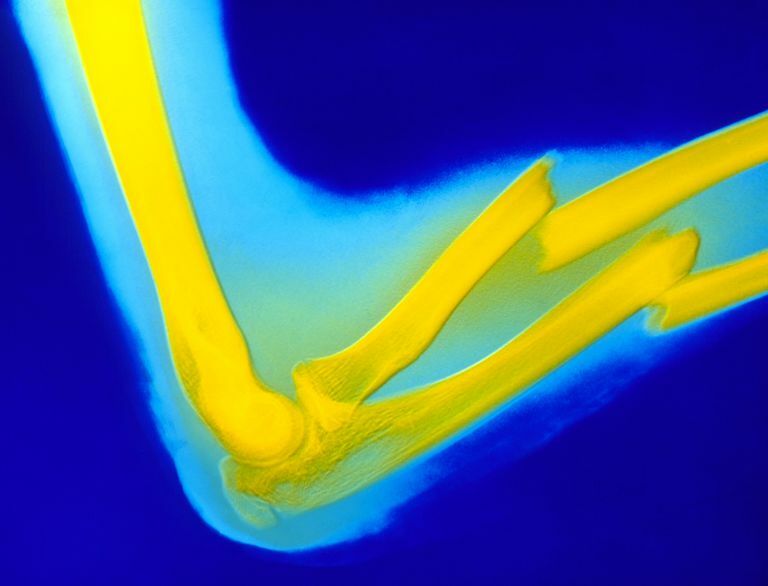 This may mean that the bone is actually sticking out of the skin, or it may mean that the skin and soft-tissue are disrupted and exposes a path to the site of the fracture. Often called a compound fracture, an open fracture necessitates different treatment from the usually closed fracture. Open fractures are a concern because these injuries can be difficult to heal, and infection can cause significant problems with the healing of the bone and the surrounding tissues. Most of the early treatment of an open fracture is focused on preventing the development or progression of infection at the site of the fracture. Surgically cleaning the bone is one of the first steps for treating an open fracture. Most patients who sustain an open fracture undergo a surgery called "irrigation and debridement." Irrigation means washing the bone and the site of the injury. Debridement is described in the next step. Determining the extent of injury can be difficult just by looking at an open fracture. This is especially true in high-energy injuries including automobile collisions and gunshot wounds. With these types of injuries, even small penetrations in the skin can cover very large areas of soft-tissue damage around an open fracture. Therefore, when surgically cleaning the bone, it is important to do this in the operating room (OR) under anesthesia -- trying to sufficiently assess and clean the bone in the emergency room, without adequate anesthesia, may be insufficient. In addition, even though an injury to the skin is already present, a larger incision may need to be made. The second surgical step of open fracture treatment is called a debridement. Debridement means removing foreign material (dirt, gravel, clothing, etc.) as well as non-viable soft-tissue. Determining tissue viability can also be a challenge, and in severe open fractures, multiple surgical procedures may be needed to ensure that all nonviable tissue has been removed. The most common way to determine if the tissue is viable is to determine if it has a blood supply. If not, the tissue would be unlikely to survive, and would only contribute to the likelihood of developing an infection. They can be quickly applied, which is often necessary with severe trauma. They allow the wound to be tended to. They secure the bone without placing foreign objects directly at the site of injury. Determining the appropriate type of fixation for an open fracture depends on the location and extent of the injury, among other factors. Antibiotics are one of the most important parts of treatment of an open fracture. Determining the appropriate antibiotic depends on the type and severity of the injury. If the injury occurred in a contaminated environment, such as a farming accident, special considerations should be made when selecting the appropriate antibiotic. Antibiotics should be administered as soon as possible, even before performing the irrigation and debridement described above. The antibiotics are usually continued for 48 hours. If a further infection is suspected, the antibiotics may be continued even longer. How much of an emergency an open fracture should be is a subject of debate among orthopedists. Traditionally, it was standard to ensure that all open fractures were surgically treated within 6 hours of the injury. More recently, some surgeons feel that open fractures, in particular, hand fractures, may not warrant as urgent treatment, and the treatment can be delayed. In addition, an argument can be made that rushing to the OR with an on-call team in the middle of the night may not be as safe as waiting until the following day to perform open fracture surgery. Most orthopedists agree that each open fracture needs to be treated quickly and safely. If the safest treatment involves a time delay beyond 6 hours, that may be appropriate, but in some cases, the safest treatment is to get the patient to the OR as quickly as possible. Either way, open fractures are orthopedic emergencies, and evaluation should not be delayed. The prognosis of an open fracture depends on the severity of the injury. Open fractures are classified as Grade I, Grade II, and Grade III, with increasing amounts of energy and soft-tissue injury as the classification increases. Grade I injuries usually heal as a normally closed fracture. Grade III injuries have a high risk of infection and nonunion and may take much longer for healing. People who sustain an open fracture can expect their fracture healing to take longer, and their recovery to be more prolonged than would be the case with a closed fracture. Complications are common after open fractures occur. These complications are the result of the severity of the injury, the likelihood of infection, and the delays in fracture healing that occur as a result of the fracture being open. The best way to prevent complications is to seek urgent medical treatment, and ensure you have careful follow-up with your physician. An open fracture is a medical emergency that requires prompt treatment. Open fractures or serious injuries they can lead to complications of infection and delayed bone healing. For these reasons, open fractures require urgent evaluation, followed by prompt treatment. Many open fractures will require urgent surgical treatment to clean out and stabilize the bone. In addition, antibiotic treatment is almost always necessary in order to lower the chance of infection. Even with ideal treatment, the risk of complications associated with open fractures is high. Werner CM, et al. "The Urgency of Surgical Débridement in the Management of Open Fractures" J Am Acad Orthop Surg July 2008; 16:369-375. Halawi MJ, Morwood MP. "Acute Management of Open Fractures: An Evidence-Based Review" Orthopedics. 2015 Nov;38(11):e1025-33.